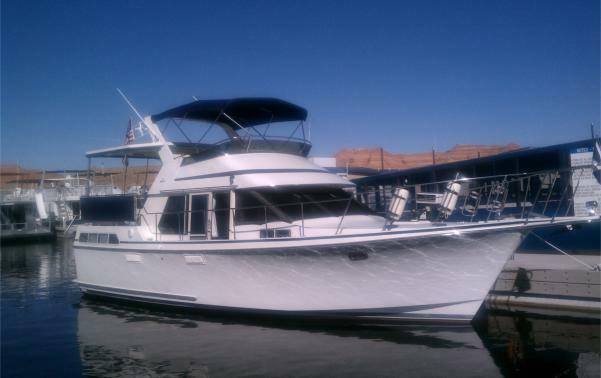 Delivered new at Lake Powell, Kiva has been owned and berthed at Bullfrog, Utah in pristine fresh water. 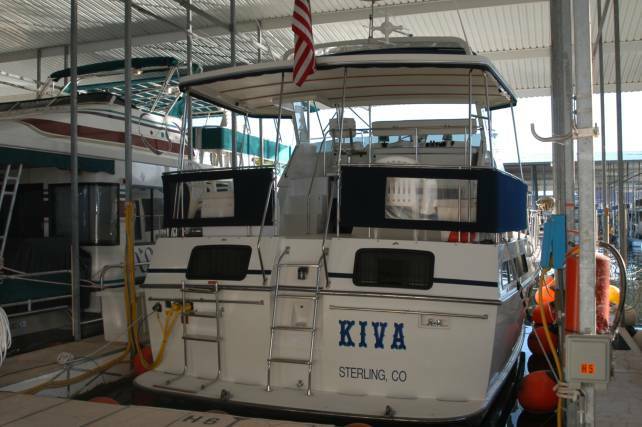 This is a very popular model of a well built boat, well equipped, very low hours, in above average condition, and has been well maintained. The aft-cabin semi-displacement FRP hull is roomy and ideal for cruising! Surveys done in 2000 & 2006 were $279,000 and $245,000. Fuel Capacity : 400 gal. The main salon is center, the galley, dinette, forward cabin and head are lower, main stateroom with its own head is aft. 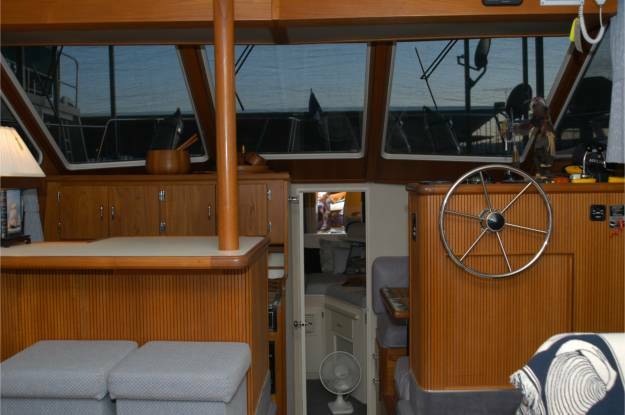 Aft deck is covered by a hard top, and has stainless railing with dodgers and deck box. 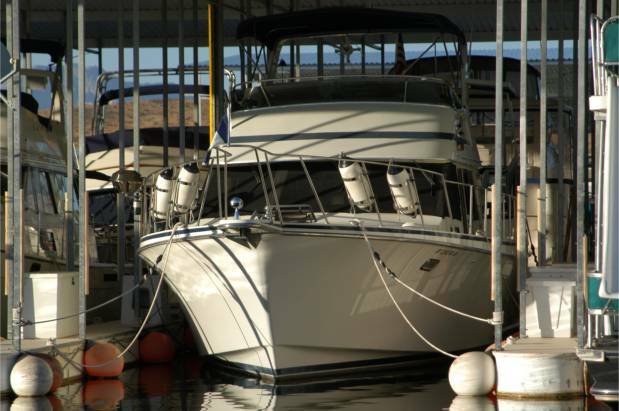 The bridge has comfortable seating, accessible from the aft deck, and more padded deck boxes. Canvas covering Bimini, windshield, helm, chairs, deck box, and dodger is all new. The engine room is below the main salon and contains twin Cummins 6BTA-5.9 Diesel engines with 500 hours, rated at 300 horsepower each, tuned and ready to go. Engines are turbo-charged, after-cooled and have Walker Air-seps. Two 200-gallon fuel tanks total 400 gallons. Engine controls are Mathers Micro-commanders with Glendinning synchronizer. Engines have closed coolant heat exchangers, seawater pumps. Steering is Hynautic-hydraulic. Transmissions are Twin Disc ratio of 1.97 to 1. Shafts are 1 ¾” Stainless and props are 24 X 24 three-blade Columbia, fresh tuned. Generator is 8kw Westerbeke Diesel with 400 hours in sound shield. There are four new batteries, one 8D house, two 4D main engine starting, and one Optima generator starting. Two Marinco 50 amp shore power inlets supply AC power to AC systems and battery charger. Fresh water tank capacity is 140 gallons and there is an 11 gallon electric hot water tank that is also heated by an engine heat exchanger. There are heads in each stateroom, forward and aft, with 20 gallon holding tanks. Sinks and showers drain overboard. 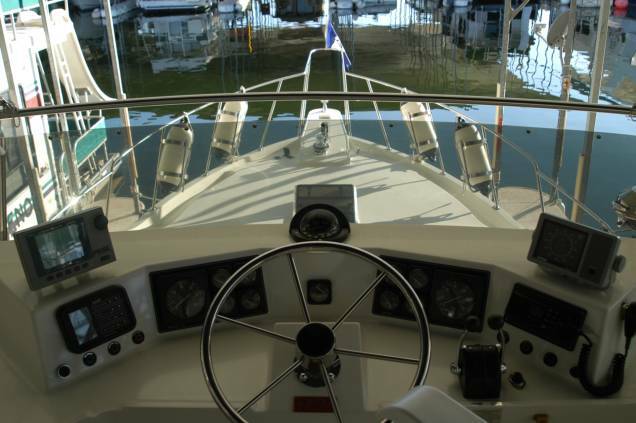 There are 12-volt windlass controls on bow or bridge. Danforth anchor and 5/16” chain. There are VHF radios, Datamarine Dart depth sounder, speed indicator, miles run and water temperature indicators. There is Interphase forward sonar and Sitex radio direction finder. Panasonic 17” LCD TV & VCR, Audiovox cassette AM/FM receiver with six Bose speakers. There are four new mounted dry chemical fire extinguishers and an automatic halon extinguisher in the engine room, just inspected. Automatic oil change system on all three engines. Other options are Helm stations at bridge and in salon with engine and speed instrumentation, Bennett trim tabs, Rudder indicator, three Lunaire heat/air conditioners, Canvas enclosure for aft-deck and bridge, telephones in salon and master, wired from dock, and three station inter-com. Galley is furnished with three-burner Princess 120V stove, Sharp Carousel micro-wave/convection oven, trash compactor, icemaker, Norcold 12/120-volt refrigerator/freezer, central vacuum cleaner and double stainless sink.